Klein Tools recently released a new wire stripper – the heavy duty wire stripper. These ain’t your typical wire strippers! 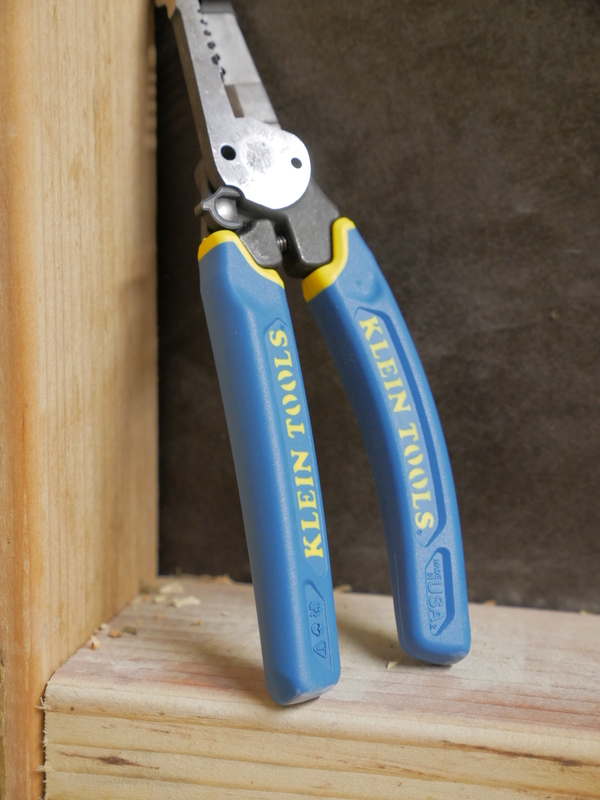 The Klein Tools Heavy Duty wire strippers feature a forged steel design that gives them the strength of pliers. 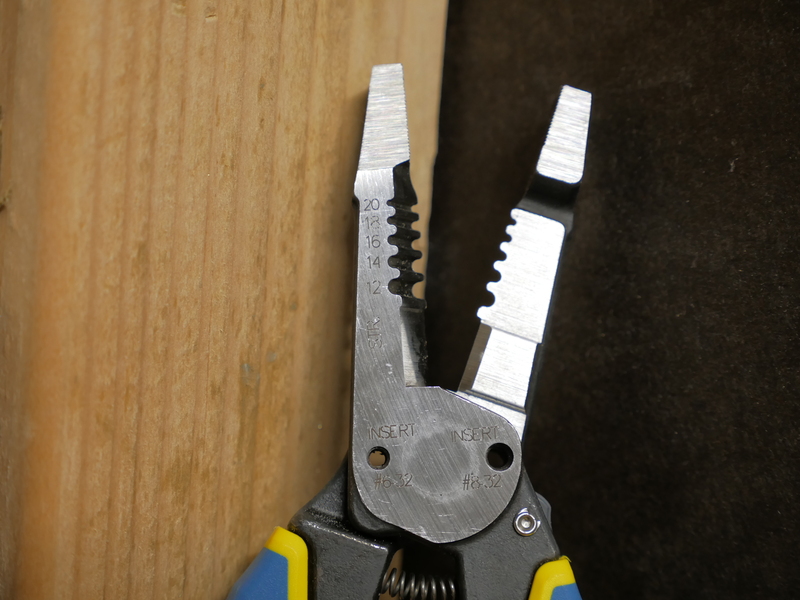 That plus large beefed up jaws with a knurled texture allow them to be used as pliers to twist wire. 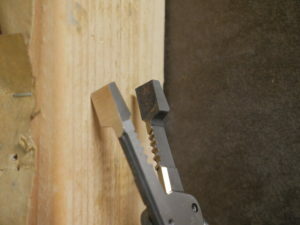 I was provided a review sample at no cost to me from Klein Tools for the purpose of an un-biased review. I was not paid for the review and I am not obligated to provide a positive review. All my thoughts and opinions in this review are my own and I will provide an un-biased review to the best of my ability. Lately I’ve been doing work at a family members place (Mom) and much of the work has been electrical. 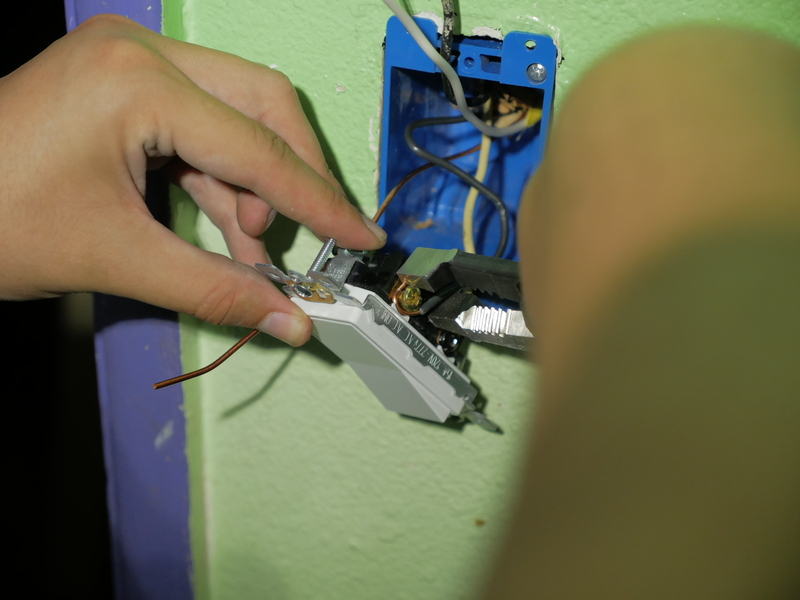 I’ve been wiring up a bathroom from the ground up and also upgrading one of her bedrooms to include 3 way switches. 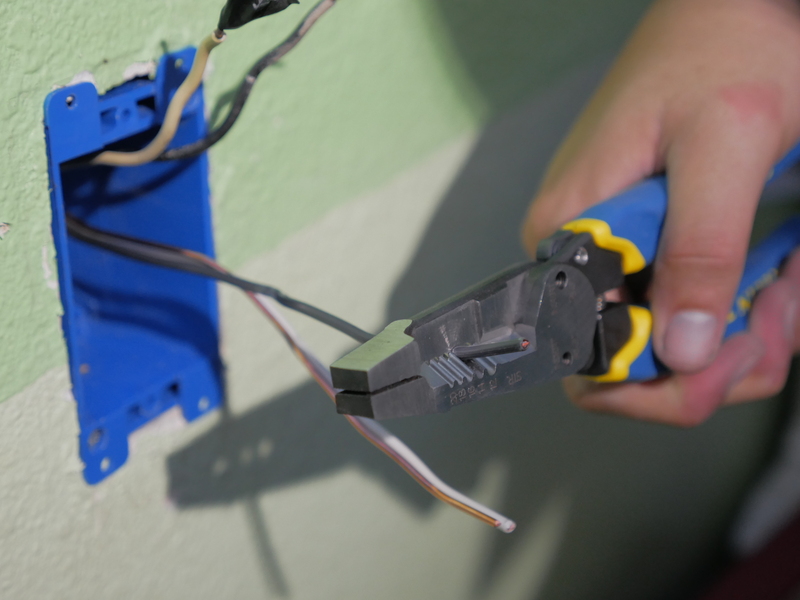 When doing electrical I normally use a set of wire strippers for stripping, cutting, and looping wire and also a separate set of linesmen pliers to twist wires which has mainly been for pig tailing. What’s great about the new Klein heavy duty wire strippers is that they give you the functionality of a wire stripper and the added function of a set of pliers for twisting wire which means you can effectively take one tool (the Klein heavy duty wire strippers) instead of two (wire strippers + pliers). 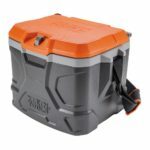 This means having to juggle less tools and take up less space in your tool bag. 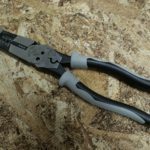 For $29.99 you get a lot of tool, we already mentioned the beefed up jaws, they can strip wire from 10-18 gauge solid and 12-20 gauge stranded, they can cut wire with cutting jaws, they can also cut down 6-32 and 8-32 screws, feature a spring for easy usage and a lock to keep them closed when not in use, and also feature large beefed up handles with plenty of grip. 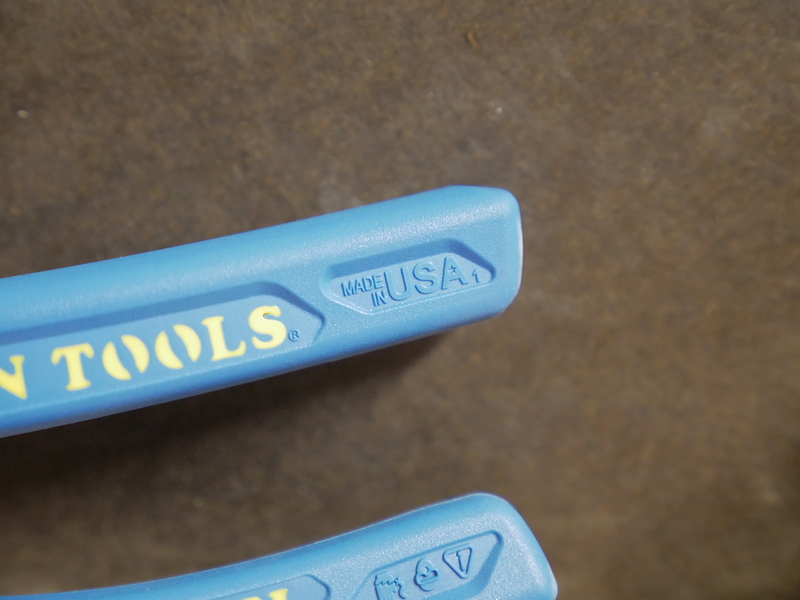 Klein calls them comfort grips and they are pretty comfy as far as pliers / wire strippers go. The build quality is very good, all the machining is done well, and the strippers are easy to use when it comes to wire stripping. I do like the oversized jaws as they do aid when it comes to twisting wire. Klein says they are designed to twist up to 3 wires. 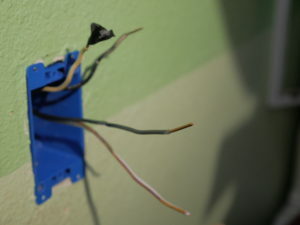 At the time I received the wire strippers most of the bulk of my electrical work was done. They did come just in time to be used while I upgraded one of the rooms to a pair of 3 way switches. There was only one instance where I needed to twist a set of wires but it was only two wires. The Klein heavy duty strippers did great in this regard and I liked that I didn’t have to reach for another set of pliers to do it, as I did all the electrical work with one tool. 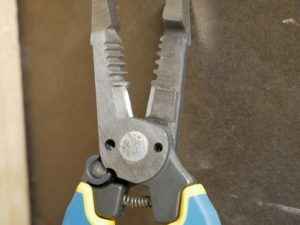 The handles are very comfy as far as pliers and wire strippers go but I noticed that the wire cutters bite into wires instead of shearing through them like scissors do. This means that they cut wire more like bolt cutters do, but they don’t offer the same leverage as bolt cutters which means that cutting wire is possible but requires more effort on your part. 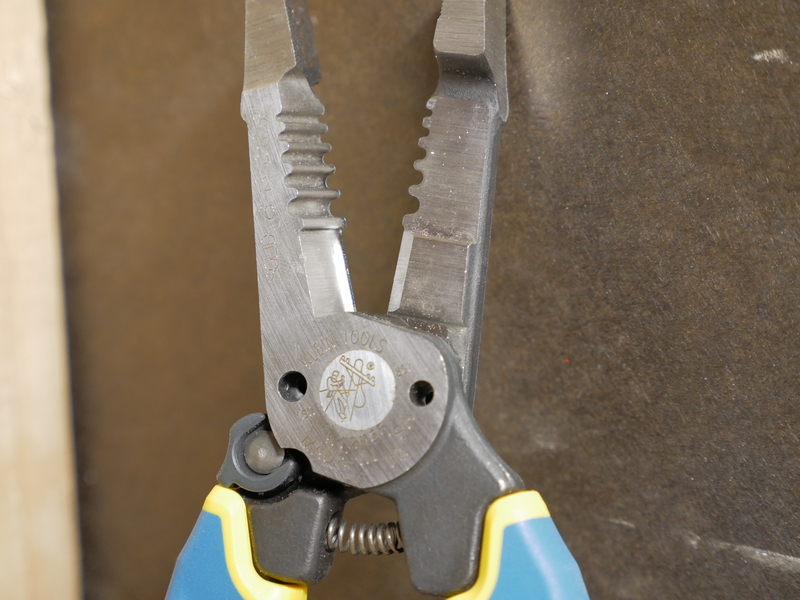 The cutters are wide enough to cut non metallic sheathed cable (romex) in one pass but they require much more effort than other wire strippers I’ve used. 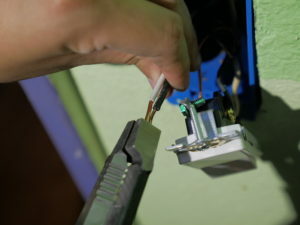 This puts a lot of strain in your hands, the comfy handles dampen a lot of the pressure but they can only do so much before it almost becomes painful to cut non metallic cable. I said almost because they don’t become painful but you get the point, the handles do great it’s just you need that much more pressure because the cutters don’t shear. By the way I used the Klein HD wire strippers to cut 12/2 and 12/3 non metallic cable. Stripping wires was good (it’s hard to get this wrong) and the markings are easy to read to see which size gauge your stripping. My only gripe was that one side of the strippers tells you the gauge sizes in stranded, while the other in solid. I’m used to strippers having this on both sides. Because of only listing the markings for solid or stranded on the opposite sides, I almost made the mistake of misjudging the size gauge of the existing wiring. I assumed it was 14 gauge because I accidentally had the side with stranded wire markings when it was in fact 12 gauge wire. Sure it was my own fault for mis-judging but I feel Klein should have included markings for solid and stranded on the same side so there’s no mistake such as mine. By the way I figured out the in wall wiring was in fact 12 gauge before I wired it up as I used the correct side labelled with the solid size gauges. 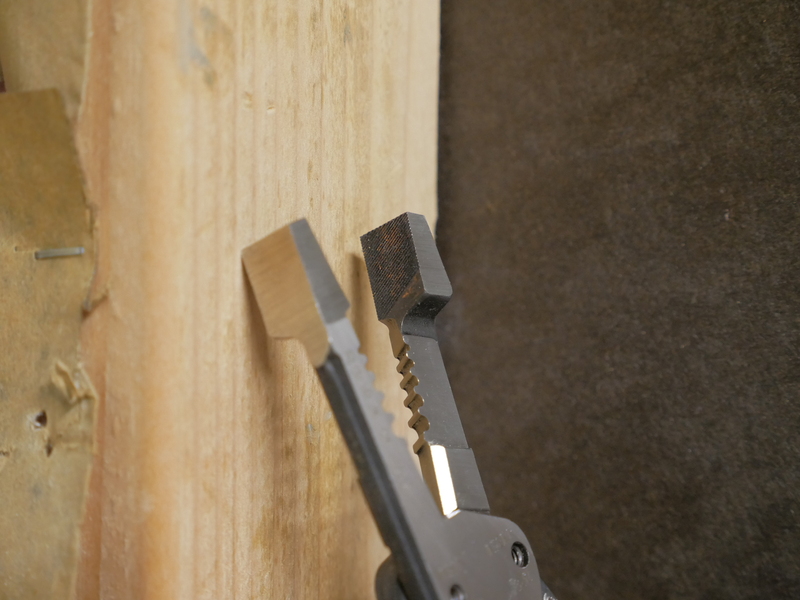 I didn’t get a chance to try out the bolt/screw cutting feature as that’s not something I normally do but I did like the spring action on the Klein wire strippers and at first I didn’t care for the lock they implemented but after some use I ended up liking it. (EDIT) Not long after I completed this review, I was doing some electrical in the garage and needed to cut the small screws that hold the cover plate of an electrical box. They were already very short and just needed to trim off maybe a 1/16 of an inch off but since the screws were very short, the thicker beefier build of the Klein HD wire strippers made the holes to deep for the screw to even reach the halfway point to be sheared so I was not able to cut the screws with the Klein HD wire strippers in this review, so they lose a few points in this regard. This is a drawback of the thick design since they are essentially pliers as well. 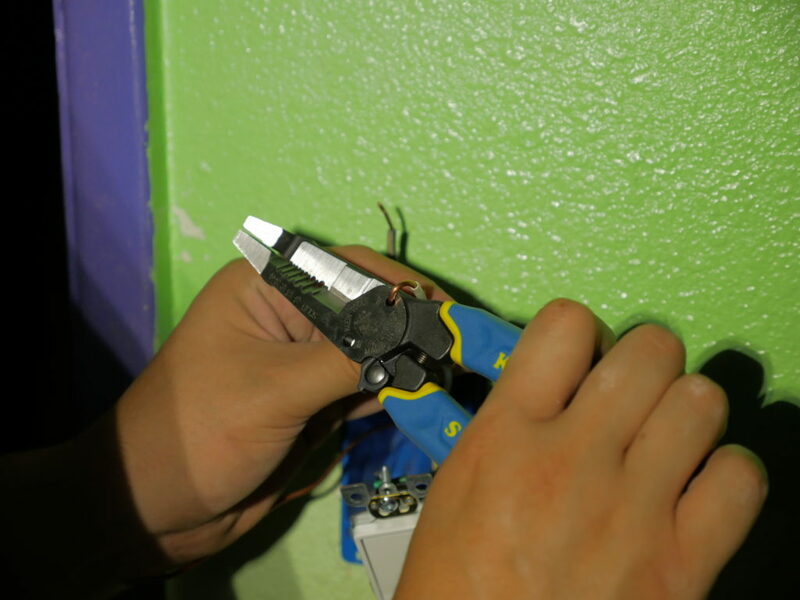 I had to use my stamped steel Greenlee wire strippers which had much thinner frames which allowed the screw to be cut the my desired length. It features a small knob with a small tab that turns and is easy to unlock but is not as easy to lock when it’s unlocked because the stick out tab is flush. There’s a small indent that your finger gets into to lock. It doesn’t come natural at first but you get used to it and soon enough you’re a natural and can lock and unlock the wire stripper one handed. I thought the oversized jaw tips would make it hard to tighten wire loops over screws but if you finesse it you can get it done which was a surprise to me. Although I’d still prefer using the tiny jaw tips on typical wire strippers for this use. 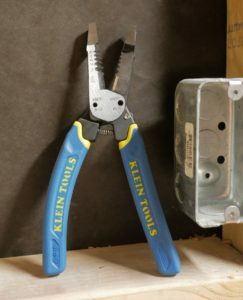 Since I’m talking about wire loops, I didn’t see any mention of a built in wire looping feature on the Klein heavy duty wire strippers. This feature is a regular feature common on other wire strippers and uses a hole to aid in wire looping. 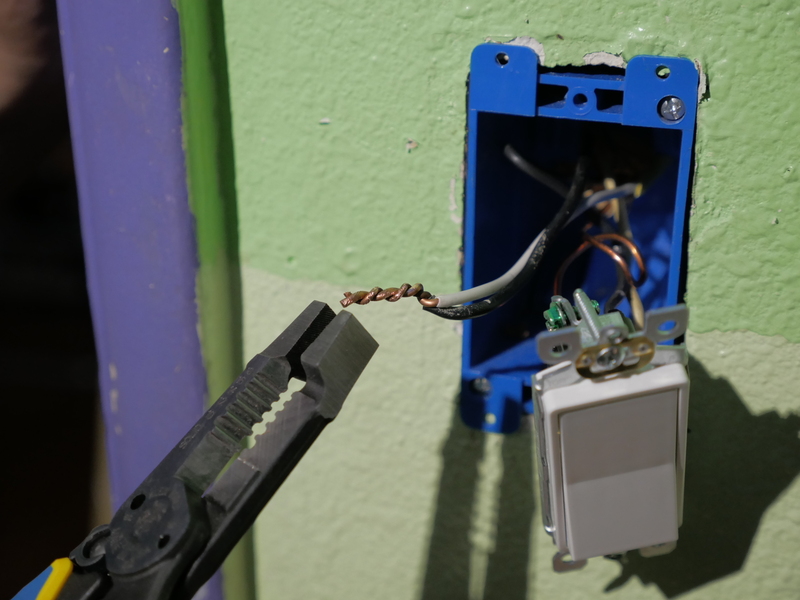 Although I didn’t see this as official feature on these wire strippers, you can still use the bolt cutting holes as make shift wire loop makers with decent results. 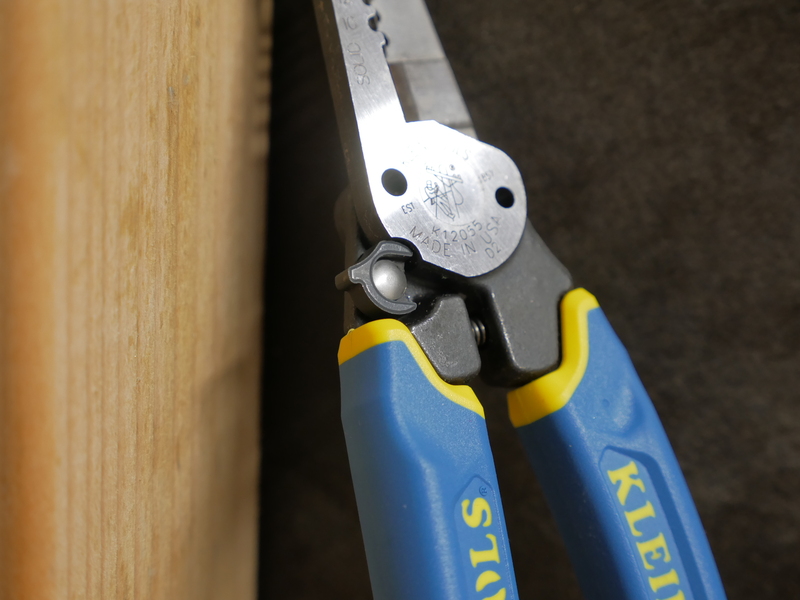 Overall I’m pleased with my experience with the Klein heavy duty wire strippers. I like the overall beefed up design, the large jaw tips make it easy to twist wire which means I don’t have to reach for my linesmen pliers as much, and the oversized handles are comfy. What I didn’t like as mentioned above are the cutting performance as they bite and crush wire instead of shearing through it like scissors do. 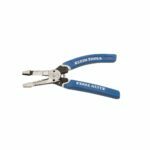 The cutting action is very similar to bolt cutters but these Klein wires don’t give you the same leverage as bolt cutter do which means it requires way more pressure to cut than is needed compared to other wire strippers when it comes to cutting. Personally I would have preferred if Klein labeled gauge sizes for stranded and solid on the same side. Users of traditional wire strippers might have a hard time tightening the wire around loops but with some getting used to it can be done. 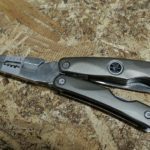 Although the large jaws means the strippers will not be able to reach into tight places where typical wire strippers and needle nose pliers normally would. 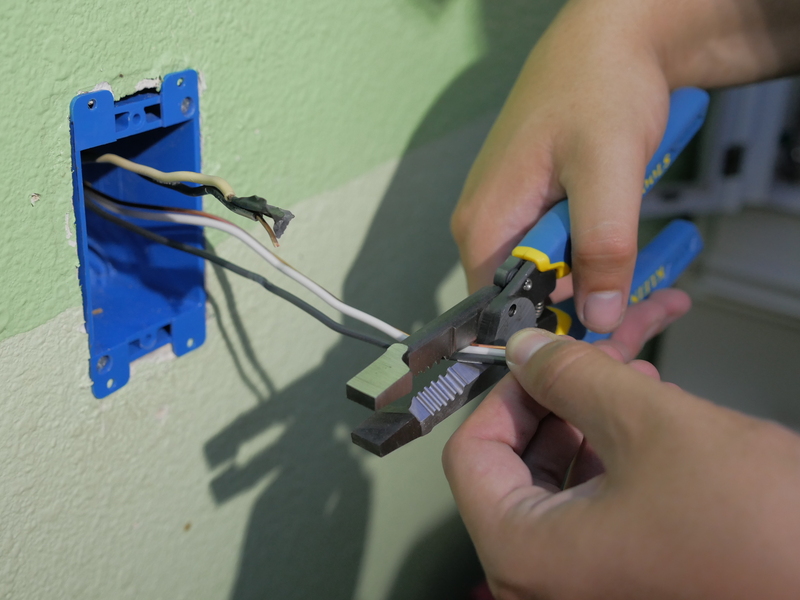 I would say get these if you want a beefier stronger and more rugged set of wire strippers and you twist wires often and want essentially two tools in one (wire strippers + pliers). Don’t get these if you rely on your wire strippers for doing the bulk of wire cutting and cut lots of NM cable with your wire strippers. That is unless you want an extreme workout and want to get those beefed up “ripped” forearms you’ve always been wanting.